It is Hollywood, 1979, on the cusp of the Greed Decade, when Maxwell Rider arrives in Los Angeles from the East to break into filmmaking. His introduction to international film-maker Alex des Prairies launches Max into an exotic landscape of extreme-narcissists where style is the only currency. Raised in wealthy homes where his mother worked as governess, and shut out of his titled father's life, Max is seduced by the extra-ordinary lifestyle of Alex's circle. As partner in Filmland Bank, with tough New Yorker Irving Fain, Max agrees to produce Alex's film, and falls for Susie Grass, an elusive heiress whose only asset is a gold mine that she must win from her dissolute father. Max's friends lead him down tangled paths and he must scramble to avoid an FBI sting of Hollywood. When Alex's carelessness on the set results in injury to a young actor, Max steps in to save the actor's life - and forge a link to his own integrity. 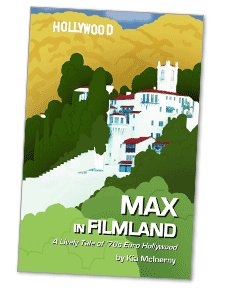 The author is an attorney whose connection to Hollywood insiders led to Max in Filmland. Her stories have been featured on KJFC FM radio's Unbedtime Stories and in literary magazines. Her short story Pot Roast Dinner appeared in the Santa Barbara Literary Review and her story Zebra Sheets was a finalist in the Writer's Digest story awards. "I read the last 100 pages at a sitting to find out what happened to Max. The author has a wonderful gift for vivid characterization and convincing dialogue, and the lush, descriptive style makes a nice backdrop for a satire on greed and financial manipulation in the Hollywood of the late 1970s ..." Leonard Tourney, Lecturer Emeritus, University of California, Santa Barbara's Writing Program, and author of eight mystery novels set in the 13th century. It is October in Manhattan. Neophyte lawyer Kenna Rand is approached by Jewish advocate Michel Fein to take over her grandfather's efforts to redeem a portfolio of German bearer bonds from the 1930s. The prospect could not be less appealing. Her grandfather, Jack Rand, was murdered to prevent his carrying out the same assignment. Michael is attractive and persuasive. But it is the old black-and-white photograph found among her grandfather's effects that haunts Kenna. The image of a child in war-torn Berlin is all that exists of Jack's prior attempt to redeem the bonds. Billions of dollars in gold are at stake. Demand must be tendered to Europe's international settlements bank before time runs out. A pawn of governments, including her own, Kenna is pursued by Klaus Kessel, a ruthless agent with a private agenda, and "Countess", a cold-blooded murderess operating under the guise of royalty. Thus begins a game of international hide and seek in which Kenna uncovers chilling truths about Hitler's war on Europe, and America's part in it. The story is based on little known facts concerning Wall Street's secret alliance with Hitler to finance his rise to power. 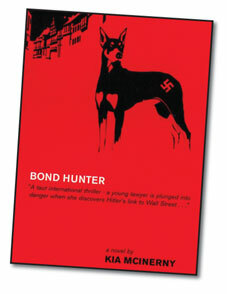 The author is an attorney, whose interest in these facts led to BOND HUNTER. "BOND HUNTER" is a riveting tale of deception and betrayal ... Fast, tense and gripping." 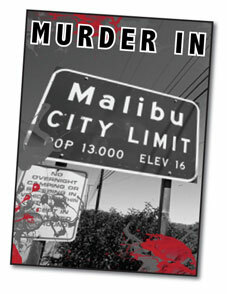 Jeffrey Weston, authority on international bonds, and author of "The German Financial Time Bomb"
It is January in Malibu when laid-back, zen-dusted Detective Lieutenant Harrison Gavin is summoned to the Palisades hills, where a young nurse named Rosebud Glenn is found floating in her boyfriend's swimming pool. At forty-two, Gavin is at a professional and personal crossroads. Younger women whom he has loved have shed him for prospects more stable or financially secure. Lately, Gavin finds too challenging the rugged surf that used to thrill him as a young man. And he is perhaps too inclined to find escape in the pulp-novels of James M. Cain and Raymond Chandler. Rosebud's death could be an accidental drowning, but Gavin does not think so. He and his deputy Andrew Navarro, quickly focus on Rosebud's fiancé, Dr. Steven Hammel. As personal physician to mega-producer Sly Halff, Hammel keeps a drugstore for his celebrity clients and drugs could be the motive for Rosebud's death. The investigation leads to a dead-end until Gavin uncovers an affair between Hammel's former partner and Nina Thomas, an elusive woman with a mysterious agenda. Nina enlists Gavin to protect her twin sister Kendall, whose testimony she says will link Hammel to Rosebud's death. But when Kendall puts a pistol in her mouth and splatters her silicone-deformed features all over the marble bath of her Wilshire Boulevard penthouse, Gavin's tour of the glitter capital turns ugly. Are Rosebud's and Kendall's deaths related? Gavin thinks so. Just as Gavin cobbles together a murder case against Hammel, his prime suspect turns up dead of a morphine overdose in Sly Halff's guest house. But the night is not over until the mega-star's own scuba-suited corpse is dragged from the Malibu surf. In his path to professional redemption, Gavin uncovers a little blackmail, a lot of greed, and more than enough murder. In the end, he must put aside private conflicts to probe deeply the secrets of L.A.'s film business. Short story as published in "Santa Barbara Review"
"When she received her first paycheck for minding the Alzheimer wife - poor soul, there was always somebody worse off than oneself - she decided to treat herself to something special. At four o'clock she drove to New Park . . . "
I submitted this story to two top New York editors at a UCLA writing seminar over a weekend. They used it as an example during the seminar, illustrating the successful use of distinctive voice and original point of view. I had not received praise for my fiction writing since 7th grade. I was thrilled. Because the story is so short, by the end of the seminar, the draft was completely line-edited. It sparkled. 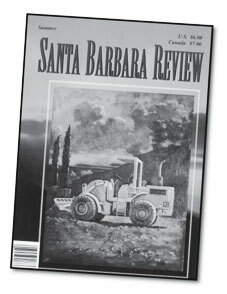 Later that year, I met the editor of the Santa Barbara Review and asked her to read it. Another excitement. She said she would publish it! I am proud of the story because it is different from my "smart" LA stories. Featured here is a character without pretense or narcissism, for whom a well-prepared pot roast dinner is something special. She is also a little worried about her finances. In short, we glimpse another sort of life than the glitter that may be familiar. It is based upon a story my mom told me.